Omid Safi is a Professor of Islamic Studies at Duke University, specializing in contemporary Islamic thought and classical Islam. He serves as the Director of the Duke Islamic Studies Center. Omid has taken more than 575 students and adults to Turkey and Morocco since 2002. This experience is what has enabled him to offer Illuminated Tours as one of the rare opportunities to go inside the deepest beauties and mysteries of one of the world's truly special destinations. Omid is an award-winning teacher and speaker, and was nominated six times at Colgate University for the "Professor of the Year" award, and before that twice at Duke University for the Distinguished Lecturer award. At the University of North Carolina, he received the award for mentoring minority students in 2009, and the Sitterson Teaching Award for Professor of the Year in April of 2010. He brings this award-winning teacher approach to every discussion in Turkey. Participants in the Illuminated Tours marvel at his ability to communicate the subtleties of religion, politics, spirituality, and history of this magical place in an accessible, straight-forward, and humorous fashion deeply steeped in a genuine humane commitment. 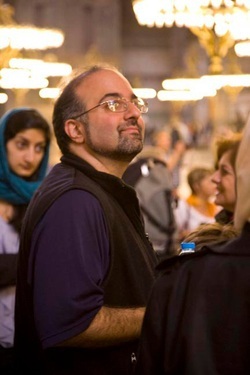 Omid is an accomplished scholar, having served as the Chair of the Study of Islam Section at the American Academy of Religion. His past and forthcoming books are from University of North Carolina Press, Cambridge University Press, Yale University Press, Princeton University Press, Harvard University Press, and Oxford University Press. He has been among the most frequently sought speakers on Islam in popular media, appearing frequently in the New York Times, Newsweek, Washington Post, PBS, NPR, NBC, CNN, and international media. He blogs at On Being with Krista Tippett, and has a podcast at Be Here Now.